To access Returns from Customers from the menu bar of the main TeleTracker Online screen, click Transactions > Returns, then From Customers. icon located on the TeleTracker Online toolbar. All items marked in RED are required fields and must be populated before the Return can be saved. 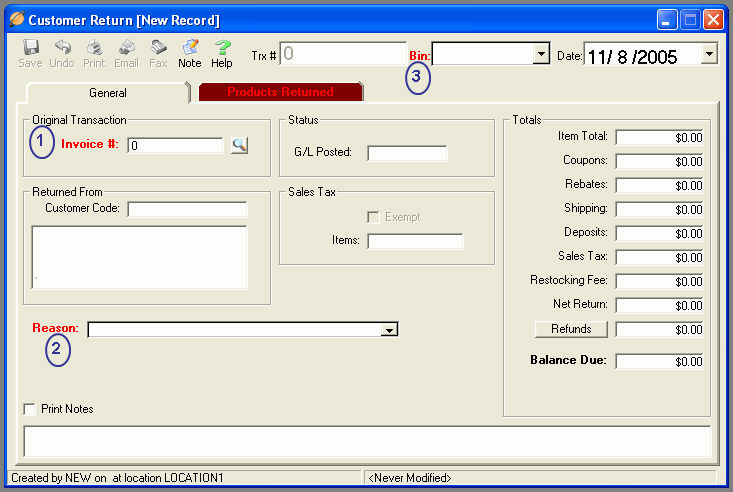 Enter the Invoice # of the original TeleTracker Online Transaction. To perform a lookup of available transactions, click on the lookup button to the right of the Invoice # field. TeleTracker Online will automatically populate the Returned From section of the screen with the corresponding customer’s information. If you attempt to return items that have already been returned, you will be prompted with the following message: “All Items on this Invoice have already been returned”. You will not be permitted to proceed without entering a valid value in the Invoice # field. Select an appropriate Reason from the drop-down list. Reasons enable the ability to track why specific transactions are occurring. Visit the Reasons Help Page for information on setup and configuration. Select the appropriate BIN to place the returning products. You can make any bin a default for returns. To setup a default bin go to Preferences and click on Customer Returns. TeleTracker Online recommends creating a Returns Bin. This enables you to quickly put returning merchandise into a Bin that is separate from your sellable inventory. Visit the Locations Help Page for more information on creating and managing BINS.